Hello I'm Don, owner of Easy plumb Bristol. We specialise in fixing plumbing problems and bathroom installations. 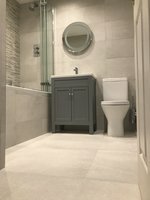 We offer a full Bathroom installation service from help with the design and ideas, through to the installation, tiling, electrical work and any plastering needed. For Bathroom installations, the big advantage of using us is that you get to meet me when I quote, knowing it will be me who carries out the installation. This is because as the business owner, I am fully committed to making sure you are entirely satisfied with the work done as I value my reputation highly. If you would like any plumbing work carried out or need a quote for a bigger job, then please feel free to contact me. Don partially replaced two bathrooms. When he quoted, It was immediately clear that he had a lot of experience and this proved to be the case in his execution of the work. He came on the agreed date, stayed within the budget and timeline and left everything neat and tidy and we are really pleased with the result. We would certainly use him again. Don was recommended by a friend. He was quick to communicate and very friendly. I needed a radiator swapped and the washing machine moved. He thought carefully about how to solve the inherent problems and did a great job. Definitely recommended. I would highly recommend this small plumbing business, I have been most impressed with Don and his brother Ed . I have been most impressed with their standard of workmanship which has been excellent from start to finish. I had a brand new bathroom to replace an old one. Don & Ed proved to be very professional, competent, reliable, trustworthy & very honest. The job was started on time, completed early I had a very competative quote which was as stated & did not increase in price. I was guided to buy my fixtures & fittings. Other additional jobs have been undertaken with equal care & diligence. Most impressed & will definitely be using again. Well worth the wait!! 5 star. Great attention to detail and very good quality of work. Flexible, helpful and extremely resourceful. This is the second project Don has done for me and I am very pleased. Punctual and courteous too. Don & Ed are a pleasure to have working in the house. They are tidy, hard working and reliable. We are very pleased with the standard of work & the finished result. I was really happy with the quality of work that Don did - several jobs including tiling and fitting a pump to deal with water pressure problems. I had to wait a ew months from quote to the job being done but it was worth it. I have the tiniest en-suite, Donald rojers did a full upgrade for me and I could not be more delighted with the end result. I had plucked his name from a random Google search, so I was taking a bit of a risk but it paid off and more. My en-suite is now beautiful - he has made it look twice the size. Donald is a very polite, courteous person who will advise but not push and has a good eye for what is right. He completed the job on time and on budget and helped me with the overwhelming choice on the market by sourcing and buying some for me. Tidy, trustworthy and professional, I will ask Donald to do work for me in the future. Wet room and WC - very pleased. This is the fourth time I've asked Don & Ed at Easyplumb to do work at my house. Friendly, prompt, great value and excellent quality. Cannot recommend any higher. Restore your faith in workmanship! Don gutted and re-fitted our apartment bathroom and did a fantastic job. He is professional, skilled, painstaking and completely exceeded our expectations. The work was finished to a very high standard, within budget and it was completed more quickly than any of the other quotes we received because he was on site doing the work himself.